Harvard basketball: How an elite academic institution became part of the problem with college sports. How Harvard became part of the problem with college sports. Siyani Chambers and Laurent Rivard celebrate as Harvard beats New Mexico 68-62 in the NCAA tournament. Only in college sports can a school with an endowment the size of the GDP of Jordan be celebrated as a giant slayer. Until a few years ago, Harvard was an elite university with arguably the least-elite basketball program in Division I. In the Ivy League, only Brown has a worse all-time winning percentage. But on Thursday night, Harvard sloughed off its historical terribleness, toppling No. 3 seed New Mexico 68-62 to make the Round of 32. The upset was the culmination of a six-year effort to upgrade Crimson basketball. More interesting than the fact that Harvard succeeded is that, at a time when moral outrage against the NCAA is reaching a crescendo, the school bought in to major-college sports in the first place. Even so, it’s undeniable that Harvard is now recruiting a different kind of athlete. Though the school has continually refuted the allegation that—as Yale coach James Jones told Thamel—there was a “drastic shift in restrictions and regulations with the Harvard admissions office,” there has clearly been a drastic shift in the pedigree of the players coming into the program. The most-talented player in Harvard history, Jeremy Lin (who was recruited by Amaker’s predecessor Frank Sullivan), was in fact a fairly typical Crimson recruit: an academic standout who didn’t receive any Division I scholarship offers. 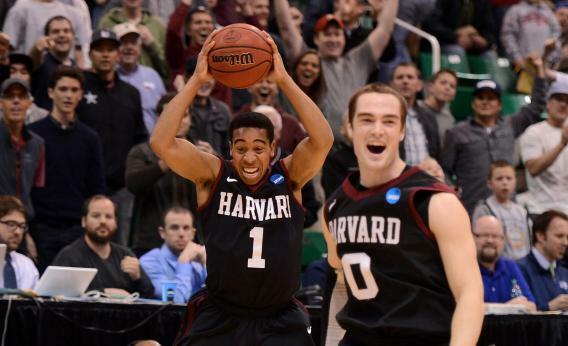 Now, Harvard competes for guys that basketball schools actually want. Wesley Saunders, the team’s leading scorer against New Mexico, was also recruited by USC and Stanford. Zena Edosomwan, a top-100 recruit who committed to Harvard last year, could’ve gone to UCLA, Texas, or Washington. Amaker’s arrival coincided with the school’s decision to expand its policy of giving grants rather than loans to low-income students. That means that despite the Ivy League’s prohibition against athletic scholarships, Harvard can now offer a great number of the nation’s best basketball players the same thing as any other school: a free education and the chance to play in the NCAA tournament. * And as Amaker said last year in laying out his recruiting pitch, “Going to the No. 1 school in the world is an attractive option.” Indeed, the Crimson’s talent pool is now deep enough that the team thrived this season even after losing senior co-captains Kyle Casey and Brandyn Curry, who withdrew from school due to last year’s academic cheating scandal. On the occasion of that controversy, the New York Times quoted a Harvard undergrad lamenting that “[s]ome athletes are here working hard, but others avoid academic challenges. You know you won’t find them in a deductive logic course, but you will find them in a much less taxing sociology course.” But the scandal here isn’t that Harvard, its coach, and its players are breaking the rules—it’s that they’re playing by them. Under Amaker, a university that has less reason than any other to care about succeeding in top-level college athletics has made a strong push to do just that. Harvard, like everyone else in this year’s tournament, is abetting the NCAA, an organization that earns $10.8 billion for the broadcast rights to March Madness but doesn’t find it appropriate to pay the players responsible for the value of that TV deal. For universities like Indiana, North Carolina, and even Butler, this kind of moral compromise makes a certain tortured sense: Basketball is as much a part of those schools’ identities as any academic subject. But Harvard doesn’t need hoops to win national prestige or rake in donations. Sure, an NCAA tournament win or two will make alums tweet a little more ferociously. But is vanity enough of a reason to lie down with an institution as flea-ridden as the NCAA? More than any other school, Harvard has the financial wherewithal and the exalted reputation to help change an immoral system or just sit outside it. Instead, the school brought in a big-time coach to reel in big-time talent and win big-time games in the NCAA’s biggest event. Harvard isn’t doing anything particularly wrong. But they’re not doing anything right, either.